I had never heard of the Bleeder Group, but apparently they have been around for a year or more playing gigs. It features lead guitar player, Peter Peter from the famous Danish band Sort Sol. 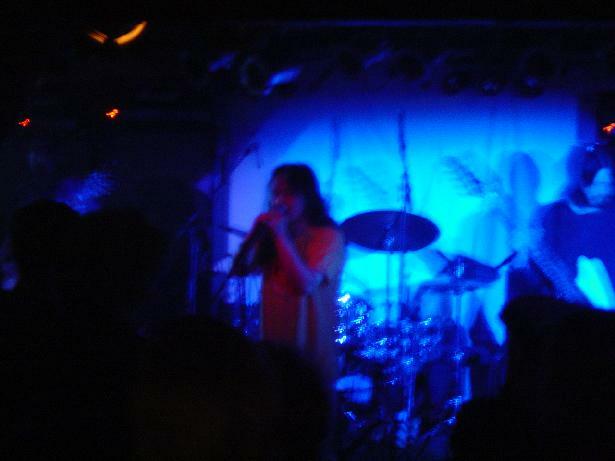 This was a special night as they were going to play with Damo Suzuki (Ex-Can). Damo has performed with a lot of bands in the past years including Mandra Gora Lightshow Society, Cul De Sac, Zeitloop, etc, but never with a Danish band. Anyway, on this night the Bleeder group consisted of 4 guitar players, bass, drums, percussion, synthesizer and a guy with a drum machine (only think he was on one song in the first set) and Damo. Ten people in total. This band is about taking long hypnotic journeys into the unknown. The first song or trip was 43 minutes long and started very slowly and Damo came in about 2 minutes in and started talking (singing) and pretty much continuing the whole way, getting more or less intense at times and totally in a trance. Very cool. The music was slow to get going with no drums until nearly 10 minutes but then the wall of sound had begun. Some very cool guitar playing was being layered into the sound as it went on. Wow. The next song, 45 minutes long, began with some strange sounding guitar that became very hypnotic in nature. This song ended up getting more intense and Peter Peter played some ripping guitar as well. I was worried it would be very loud as each guitar player had a double Marshall stack but the levels were great and the sound very clear. This song was more Can inspired than the first. The first set ended with a slow building 11 minute song with a nice melodic guitar line that layered on top of the drum machine line that had a piano line layered on top. Great stuff. Unfortunately, it was Thursday night and I had to go to work in the morning. That was the end of the first set (about 100 minutes) and it was 12:00. The band was coming back at 12:30 to play a second set of 100 minutes more I was told. Wish I could have stayed but like myself, at least half the people were leaving when I did. Cool stuff. I can’t wait to see them again.